Apply today to become a Museum volunteer! Volunteers play an integral role in helping to deliver the Museum's mission: honor, educate and inspire. They share the history and significance of our collection, provide assistance and customer service to Museum visitors, and work hands-on with staff to preserve artifacts. Volunteering at the Museum is an opportunity to join a dedicated team who share similar interests, to learn new skills, and gain a greater understanding of history, science and innovation. Plus, volunteers receive discounts in the Museum gift shops and cafes, an invitation to the annual Volunteer Recognition Dinner and reciprocal admission to other museums! Find the right volunteer post for you! Applicants must be at least 18 years old and commit to eight hours each month for a minimum of one year. As a volunteer you will receive discounts in the Museum gift shops and cafes, a uniform, and reciprocity at other museums. Volunteers have the opportunity to attend lectures, access to the resources in the volunteer ready room, and invitations to the holiday party and Annual Volunteer Recognition Dinner. Due to the Museum's high profile connections and involvement with the community there is much to be done behind the scenes. A volunteer in an administrative position will assist with filing, mailing, labeling, envelope stuffing, data entry and other duties as needed. No prior experience is required. Restoration volunteers help maintain and restore the Museum's aircraft collection through manual labor, such as painting, sanding, and riveting. The majority of restoration work is done during the warmer months. Aircraft Restoration volunteers will complete the standard volunteer training before beginning their assignment. Prior knowledge in metal works, painting, or aircraft is preferred and these positions are only available during regular business hours, Monday through Friday. 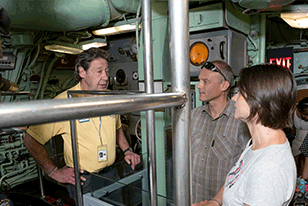 We are seeking volunteers to facilitate learning and fun in the Exploreum, Intrepid’s interactive hall. Facilitators will be responsible for replenishing supplies at exhibits, monitoring and reporting any damage and ensuring that guests are using the exhibits in a safe and productive way. This position requires excellent customer service and enthusiasm, as well as strong presentation and communication skills. Experience working with children a plus. Exhibit explainers are stationed throughout the complex, interpreting historic spaces, aircraft and artifacts. 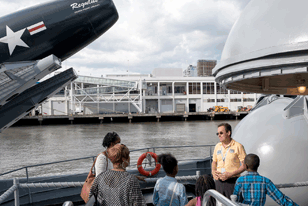 Our explainers answer visitor questions and provide information on Intrepid’s bridges, flight deck and hangar deck as well as in the submarine Growler and Space Shuttle Pavilion. In depth training is provided by the Museum about these historic spaces and artifacts. We are looking for volunteers to help staff the Information Desk. Duties require the volunteer to provide clear and concise answers to all visitor inquiries and deliver a high level of customer service. Comprehensive training will include the Museum floor plan, exhibitions, programs and events and membership. 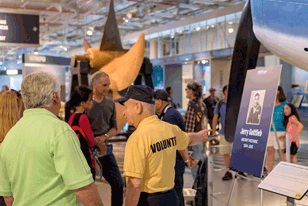 Come join the Volunteer Team at the Intrepid Museum.